I read this collection of 15 short stories several years ago and very much enjoyed it – now another group is reading it and I decided to go for a reread. This is Joyce’s most accessible work but that’s not to say it holds no secrets for the second or third time reader. Even studying it turns up nuggets. It’s a series of short stories connected by the Dublin setting. The characters are all relatively middle class and lower and it’s structured in a kind of chronological order – from youth to death. The style is very simple. detailed and and realistic. When you understand what this collection of stories is really about it’s difficult to read – almost a dirge to Dublin and her residents – they’re hopeless or closing their eyes to hope, impotent, and/or dying – “paralyzed” – as the word is from the first story – or maybe dead. Themes – The main theme may be that Dublin is trapped and paralyzed and dying but the ways that’s presented are many – religion, love, business, memory, politics, etc. 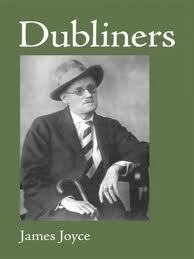 I think Joyce didn’t have much use for these “Dubliners” who were “stuck in their rut” and basically unwilling or unable to get out. It’s the opposite of finding happiness in your own back yard – it’s settling for the weeds and grime of your own back yard. I did notice the regular appearance of windows in the book and wondered what they could mean. Desire plus looking in (curiosity) or looking out (escape). Counterparts – Farrington, a lumbering alcoholic scrivener, takes out his frustration in pubs and on his son Tom. Does the son have a window? – He probably should have one. Clay – The old maid Maria, a laundress, celebrates Halloween with her former foster child Joe Donnelly and his family. This woman could use a window – there’s none in the story and there’s certainly places a window would be appropriate. So it’s noted (by me) by absence when you know what windows kind of mean in this collection. This woman is totally trapped and doesn’t know it – She never has her own place. She’s a Catholic woman who works in a Protestant mission, she’s a foster mother but never a real one. She’s a piece of clay – very moldable. She buys the cake but doesn’t have it. And she cries for the slightest (!) reason – the song points to how she had nothing. A Painful Case – Mr. Duffy rebuffs Mrs. Sinico, then four years later realizes he has condemned her to loneliness and death. Ivy Day in the Committee Room – Minor politicians fail to live up to the memory of Charles Stewart Parnell. Another story with no window – only a fire (highly symbolic) – and these guys don’t want a window – they’re in the back dark smokey room doing their political games and manipulations – no view to the people or to the future – only to a dead past – a fire which won’t get started again. I think the reader needs some knowledge of what Charles Parnell was to Ireland, and what happened after his death, to understand this story. The committee members are patriotic to Parnell and Ireland but can’t do what he did – don’t have the ideals or the skills – he’s dead and so are they. A Mother – Mrs. Kearney tries to win a place of pride for her daughter, Kathleen, in the Irish cultural movement, by starring her in a series of concerts, but ultimately fails. She’s quite ambitious, pushy and domineering. and I’m not sure what that means – she’s gone back to being a sour-puss? Grace – After Mr. Kernan injures himself falling down the stairs in a bar, his friends try to reform him through Catholicism. There is a small window in Kernan’s office but it’s half covered up so he can’t really see outside. The Dead – Gabriel Conroy attends a party, and later, as he speaks with his wife, has an epiphany about the nature of life and death. At 15–16,000 words this story has also been classified as a novella. There are a LOT of windows references in The Dead. There are cab windows through which winds blew made folks ill. And there is the very complex scene where Gabriel looks out the window and thinks of people outside looking in at the lighted window. (Poor or lonely people wanting in?) There’s a window at the party where Gabriel looks out and wishes he were elsewhere – one at their hotel room. There are even remembered windows. I think that means the past is going to come in – and Gabriel will look out to see that Ireland is covered in snow – dead – like the statue in the park. I’d love to read this again Bekah … read it for school (won’t say how long ago that was) and have always wanted to read it again.